What gives an electric charge? When you rub your balloon on your hair or cotton cloth, it builds up static electricity. What happens when you rub it on something else? (Be careful not to pop it!) 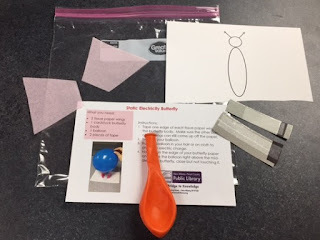 Make a list of what items generate static electricity and what items don’t. What will static electricity attract? It makes the wings of your butterfly move—what else will move when you hold your charged balloon near? Your hair? A washcloth? A plastic bag? Find out! 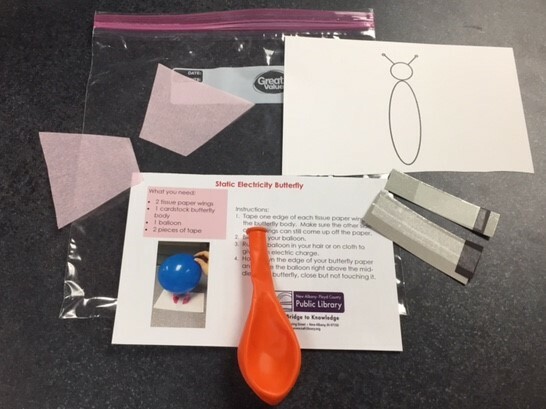 * For the materials that we bring out to our Pop-Up Libraries this summer, we really wanted to provide EVERYTHING that a kid would need to do the science activity. We weren't sure whether all of these kids would have basic stuff at home like tape, pencils, etc. So we devised a way to include tape by cutting out squares of thin cardboard and covering one side with packing tape. Then we cut strips of Scotch tape and affixed them on the packing tape with a little tab at the end (just cut out of cardboard) so that kids could pull it off. It's labor-intensive, to be sure, but we didn't include the tape in all of the bags, just the subset that we took out to the Pop-Up Libraries.